I own of a small business in Germany. I sell two ebooks (one of which is a fundraiser for the Nepal earthquake victims) and a couple of wallpaper packs (in effect digital photos). Those are officially called “digital goods”. Since the beginning of 2015, small businesses in the EU that sell digital goods are required to collect EU VAT on behalf of every EU country. There are two ways to deal with this. 1) pay tax to each EU country separately (=nightmare) or 2) use what’s called the VAT MOSS system (Mini One Stop Shop, also a bit of a nightmare) – It’s a mess (some say it’s a VATMESS), it’s complicated, it’s inefficient, it’s expensive, it creates an enormous amount of bureaucracy and it has already forced many small businesses to stop selling to other EU countries, or close shop altogether. I received the above letter. The Irish tax authorities (the “Collector-General”) have sent out those letters to small businesses in Europe claiming ridiculous amounts of tax being due. 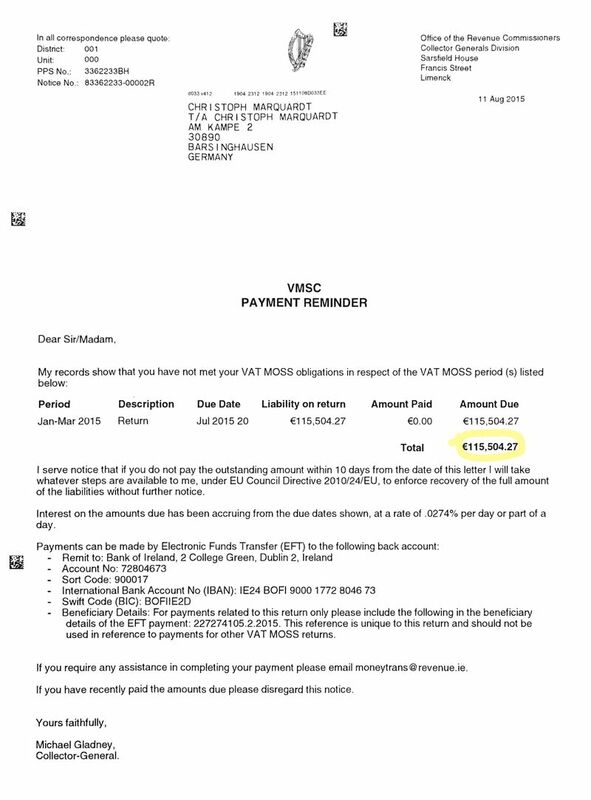 One business owner in the Netherlands claimed he was threatened to € 3,152,064.87 and there are plenty more business who came forward on Twitter or on the EU VAT Action Campaign Group on Facebook to show the unwarranted letters they had received from Ireland. Please be advised that we have issued a number of payment reminder letters to suppliers of eServices in Ireland, who are registered under the VAT MOSS scheme in other EU Member States. This is in accordance with the rules of VAT MOSS, where supplies have been made and payment has not been received within a specified time. Unfortunately, the letters contained a number of errors including the amount due to be paid. Some letters also issued to customers who had already made payment to their own tax authorities in accordance with VAT MOSS obligations. We ask you to please ignore the payment reminder you may have received from us. We apologise for any inconvenience caused by this error. We are in the process of correcting the system errors involved, and in due course will issue payment reminders to those suppliers in respect of whom we have not yet received the payments due. I’m the owner of a small business in Germany. I pay my EU VAT through our German VAT MOSS system and during Q1 I did not have a single sale to any Irish customers, thus didn’t collect any Irish VAT. During Q1 I have not made a single sale to Irish customers. During Q2 I collected Irish tax to the amount of € 6.67 which I have already paid during the German VAT MOSS system. During Q3 I again have not made a single sale to any Irish customers. Simply said, a sum of € 115,504.27 would mean certain bankruptcy for me. In fact the ENTIRE amount of digital goods EU tax that I collected during Q1 of 2015 is about € 150 in total for all EU countries together. The digital goods that I sell make up a small amount of my revenue. I sell them mostly to pay for the servers that they are hosted on. Here is my request: I would like to receive a formal letter from the Collector-General confirming that this was an error and that no further action will be taken against me by the Irish tax authorities. I would really rather have this in written form on a piece of paper instead of an email and a tweet. Have you also received one of these ridiculous letters? What’s the best way to officially complain? Let me know. Update: 17 Aug 2015: Incidentally I will travel to Ireland next week. I will need assurance from the Irish tax authorities that this ridiculous letter will not have any negative consequences for me at the border. I refer to your recent email regarding the VAT MOSS payment reminder notice you received. Due to a technical error, the information contained in these letters contained a number of errors including the amount due to be paid. Revenue is in the process of correcting the errors. In the meantime, I would advise that you disregard the recent notice. We apologise for any inconvenience caused by this error and I confirm that this will not have a negative impact on your travel. ich habe ein Schreiben von der Irischen Steuerbehörde vom 11. August erhalten mit einer VAT MOSS Steuerforderung über 115.504,27 € rückwirkend für das erste Quartal 2015. Ich bin sehr verwundert, da ich im besagten Zeitraum KEINE Verkäufe an Irische Bürger hatte und da ich für den GESAMTEN Zeitraum von 2015 gerade mal 6,67 € an irischen Steuern erhoben und diese selbstverständlich auch entsprechend entrichtet habe. Wie konnte dieser Fehler zustande kommen? Hat das Bundeszentralamt für Steuern hier eine falsche Meldung nach Irland abgegeben? Welche offiziellen Versicherungen habe ich, dass hieraus für mich keine Nachteile entstehen werden? Gibt es die Möglichkeit, über das Bundeszentralamt für Steuern eine offizielle Beschwerde an Irland zu richten? Das entsprechende Schreiben habe ich für Sie an diese Mail angehängt. […] I received a letter from the Irish tax authorities with a VAT demand of € 115,504.27 for Q1 2015. I’m surprised because I didn’t have ANY sales to Ireland during this time frame and for the ENTIRE time span of 2015 have so far collected only € 6.67, which I naturally have paid. How could this mistake happen? Has the Federal Central Tax Office reported wrong numbers to Ireland? What official assurances do I have that this will not result in any disadvantages to me? Is it possible for me to complain to Ireland through the German Federal Central Tax Office? I have attached the according Irish letter to this mail. Es gibt hier keine Verbindung zu unserer Behörde. Sie sollten sich zur Klärung entsprechend an die irische Behörde wenden. PrevDo we really need the Apple Watch?